Comment: Is all-wheel drive worth the extra? When someone tells you they have an SUV you’ll probably picture a big, brash four-wheel drive machine, but things are changing. Smaller, crossover SUVs might look like capable off-roaders but they are often front-wheel drive. Not only that, but estate cars and hatchbacks are increasingly being offered with proper all-wheel drive systems. But is all-wheel drive worth the extra? We got to find out in a rare opportunity to drive 4x4 versions of cars back-to-back with their front-drive counterparts – in this case with the Skoda Octavia and Superb. These cars aren’t designed to ford rivers and climb mountains, but all-wheel drive is offered for peace of mind and a bit of extra capability when, for example, towing a caravan across a field. But in reality most front drive cars are unlikely to get stuck unless a field is particularly wet. In fact, the advantages of all-wheel drive on a car like an Octavia are rather more subtle, but potentially more important - because they can really help out on a dangerous road surface in bad weather. For our test we first took a front-drive car out onto simulated black ice surfaces. Circumstances from climbing a hill to avoiding hazards and tackling bends were replicated. The front-drive car actually coped surprisingly well – partly because a slippery surface was expected - so we could pre-empt - and partly because of traction control and ABS. When the surface got slippery you could feel the car trying to brake wheels and cut power in an effort to get back into line. It would eventually succeed, but it took time and deceleration before anything would happen. Up to that point you were just along for the ride – the car ploughed straight on, front wheels spinning, with no steering effect at all no matter how much the wheel was turned. On a simulated surface at a test facility this wasn’t scary at all – but on a narrow country lane it’d be terrifying and could result in the car going straight on at a bend into trees, or into an obstacle like a parked car. After the two-wheel drive run we took out the same car but with a 4x4 system installed. 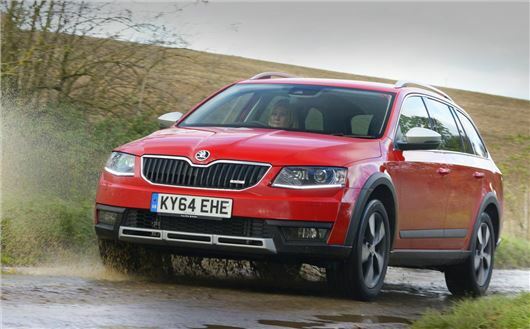 Skoda’s system only works when it has to, so most of the time the car is front-wheel drive only. It doesn’t take long for the back wheels to kick in though- as soon as we entered the slippery sections of the test course it was possible to feel the difference. It’s subtle, but you can eke out an extra five or so miles-per-hour before the car starts to get out of line. And, once it does, the systems have a lot more to work with, sending power where it’s needed as well as brake force. The result is more controllability when the car eventually does lose traction. It still skids and the systems still grind and whir away, but steering inputs work and you can carry more speed without being spat off the road. That could mean the difference between going straight on at a corner into a tree or making it around unscathed. Obviously that’s a good thing, but a 4x4 version of a car like a Skoda Octavia is usually at the upper end of the price scale and that means you’ll have to think long and hard about whether it’s worth the money. Someone who drives on town and motorway roads most of the time is unlikely to see the benefits and would probably be better off with a set of cold-weather tyres. However for those who live out in rural areas like the Welsh valleys, the Yorkshire Dales or the Highlands it makes perfect sense. Roads go unsalted a lot of the time, which means black ice and compacted snow. In those situations a 4x4 system – even on a regular hatchback – will pay dividends, especially when allied with winter tyres. Interesting though in tests I have seen, the two wheel drive 'winter' tyre shod car far out performs the summer tyre 4x4. Obviously tyre performance differs tremendously but perhaps the contact point with the road is more important than the number of driving wheels?